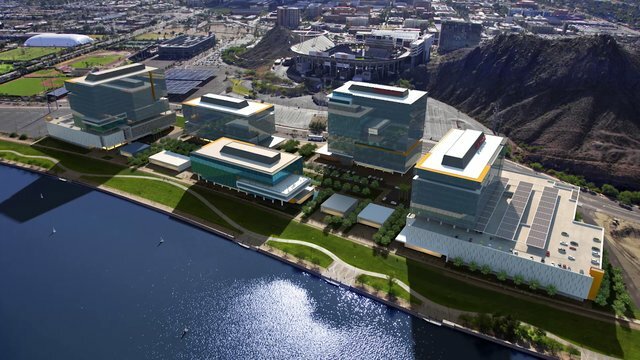 The massive Marina Heights development in downtown Tempe, to be anchored by a State Farm insurance regional headquarters, is expected to become a job hub that will draw hundreds of Valley-based prospects, dignitaries said during ceremonies Wednesday. Ground was broken on the 2 million-square-foot, 20-acre, $600 million mixed-use development that is expected to take some of the sting out of the anticipated loss of the US Airways corporate headquarters in the downtown area. The airline has said its headquarters will move to Fort Worth, Texas, when its merger with American Airlines is complete. The bulk of the Marina Heights complex, on a site owned by ASU just east of the commercial and condo high-rises on the southern edge of Tempe Town Lake and just north of Arizona State University’s Sun Devil Stadium, will be occupied by State Farm, which Gov. Jan Brewer said reflects the state’s fast-growing economy.